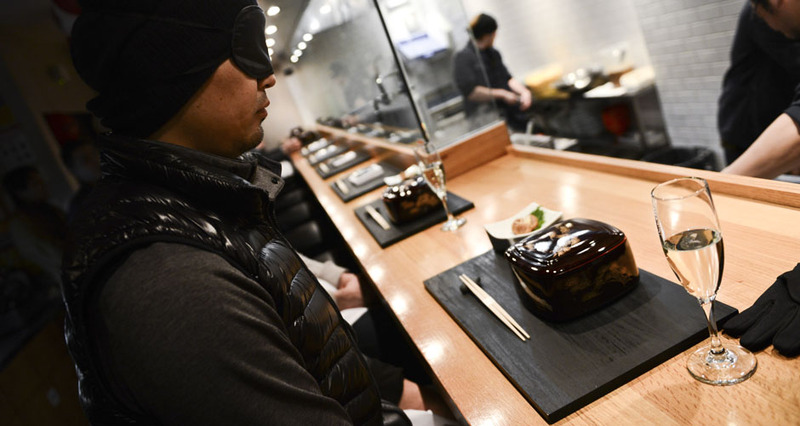 Complex's Deputy Style editor Jian DeLeon tells us why it was worth getting blind-folded for a bowl of tuna tsukemen. 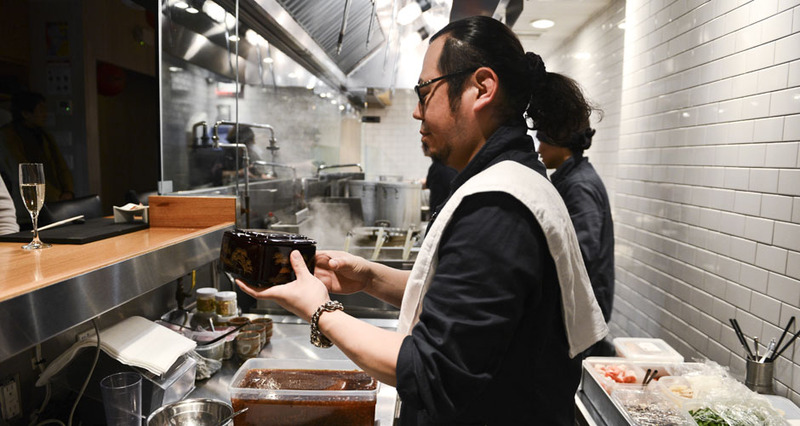 This past fall, ramen powerhouse Ippudo made headlines for something other than its intensely porky tonkotsu broth when they teamed up with NYC menswear label Engineered Garments to design exclusive uniforms for restaurant employees (you can see our photo shoot here). As a follow-up to this collaboration, the brands teamed up for a secret ramen dinner last week. 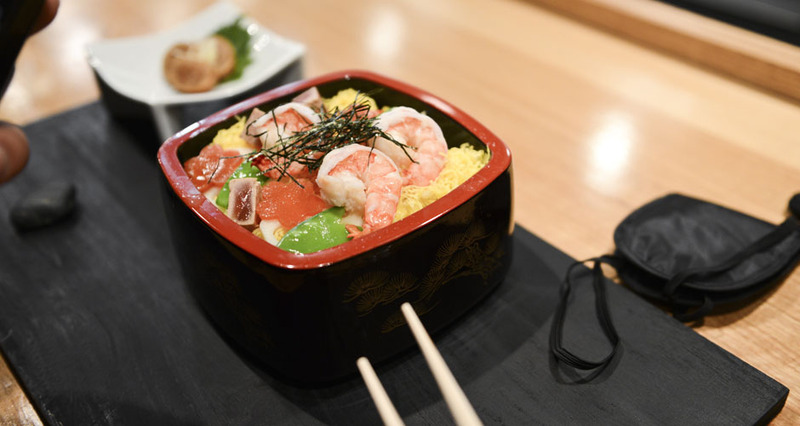 On one of the city’s chilliest nights, I arrived on the ground level of Ippudo’s Midtown location, only to be escorted to a hidden second floor which seats about ten people. Due to limited space, the menu was repeated during the course of five separate dinners, stretching from 5–9pm. I received an invite to the 7pm session from Ippudo NY Operations Manager Yusuke Nakamura, who promptly told us to put away our phones so we wouldn’t spoil the meal for the other diners. 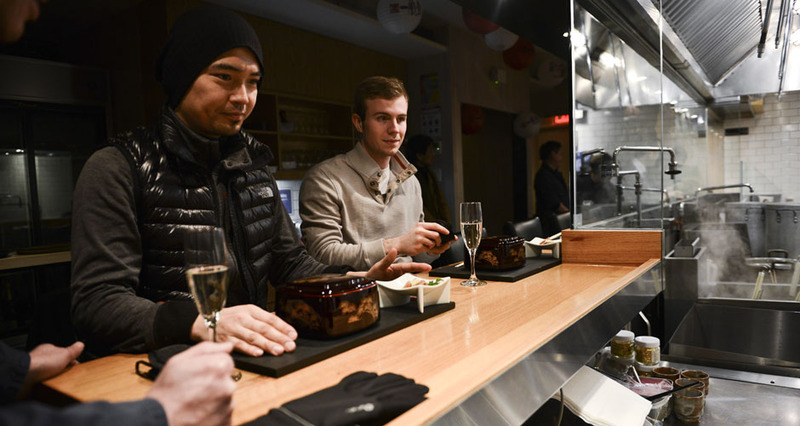 After warming up with a cup of Ichiban dashi—an Edo-style broth normally used as a soup base—we were served beer and sake. I dined with Engineered Garments designers Daiki Suzuki and Angelo Urrutia, who oversaw the uniform process (and after enough Nanbu Bijin sake, let it slip that they had also done aprons for the secretive Japanese restaurant Bohemian some years prior). Of course, the entire staff was outfitted in the collaborative uniforms—navy blue jackets made from a hardy twill—which had worn in nicely since our first photo shoot. Then came the surprise: blind folds. Since we were seated in full view of the kitchen, we were instructed to cover our eyes while the meal was being prepared. Cue the Fifty Shades of Grey jokes that inevitably ensued. After about 15 minutes of mystery, we removed the masks and were greeted with a broth-less bowl filled with extra long noodles (meant to signify the duration between Engineered Garments and Ippudo relationship) and topped with chirashizushi-style sushi. The noodles, which had been marinating in tonkotsu pork broth, were topped with fish eggs and shredded kimchi tamago. On the side was ikameshi, rice wrapped in a little bit of squid. 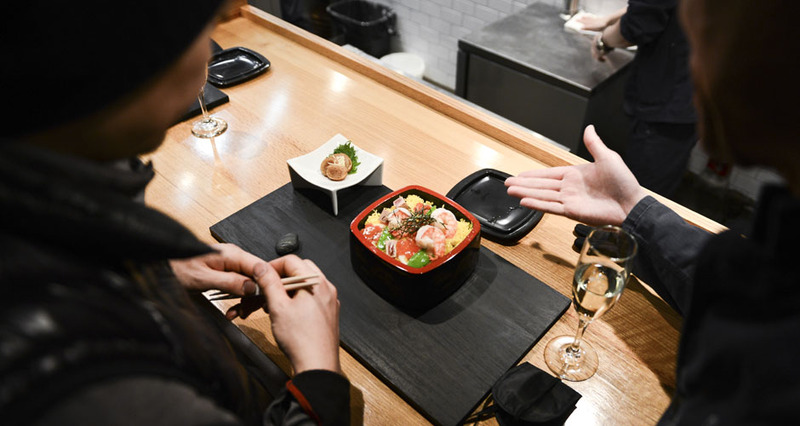 It was one of several homages to Hirosaki, the Japanese town located at the northernmost tip of Japan’s Honshu Island and birthplace of designer Daiki Suzuki. 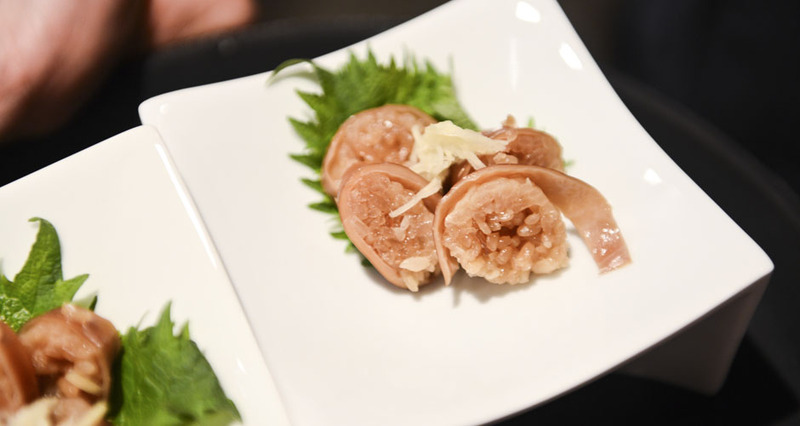 It is also a region that also specializes in fatty tuna and squid, and the inclusion of a spicy tuna tsukemen dipping broth was a tip of the hat to its rich seafood heritage. 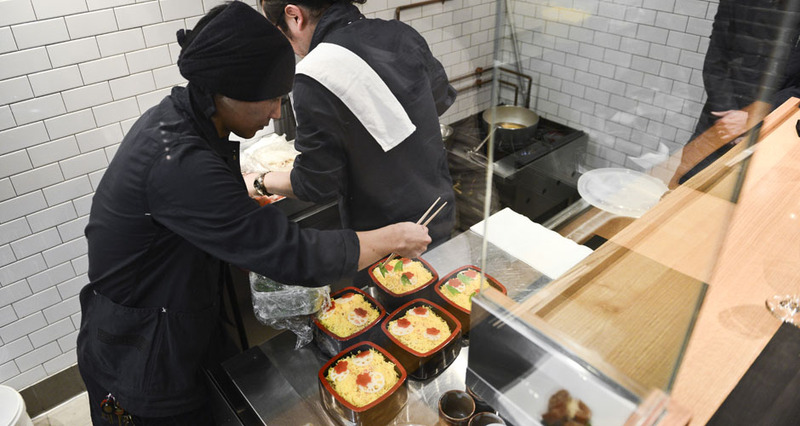 Balance, depth, and consistency—all signs of good ramen, and a successful collaboration between two Japanese companies at the top of their game. 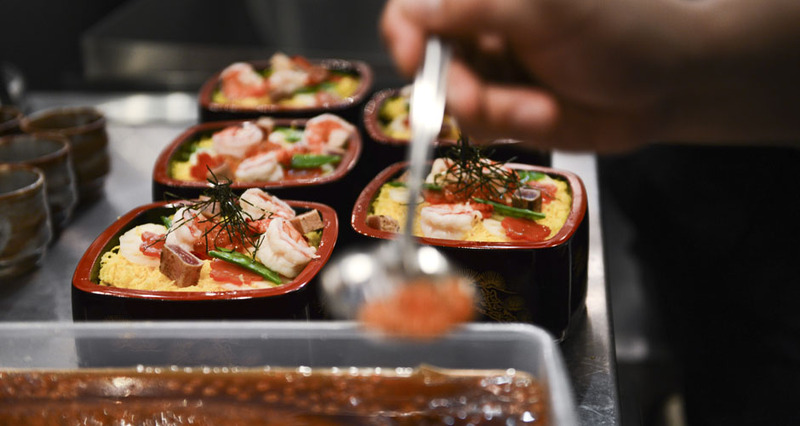 Click through the gallery above to see photos from the Ippudo x Engineered Garments dinner.